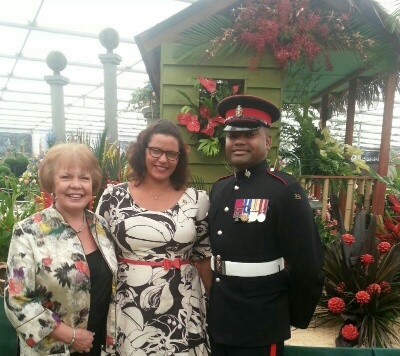 The Grenada-Suzanne Gaywood exhibit named ‘Spice Isle’ (GPB/16) has won a coveted Silver Gilt at the RHS Chelsea Flower Show 2014. This latest medal adds to the multiple medals awarded to Grenada, Gaywood and her team since 1998. Over the past 17 years Gaywood’s Grenada exhibits have successively been awarded Silver (1998), Silver-Gilt (1999, 2000) and then Gold (2001, 2002, 2003, 2004, 2005), Silver-Gilt (2006), Gold (2007), Silver-Gilt (2008), Gold (2009, 2010, 2011, 2012) and now Silver-Gilt in 2014. The fresh blooms and spices were grown in Grenada by members of the Chelsea team and arranged to Gaywood’s design ahead of Monday 19 May. 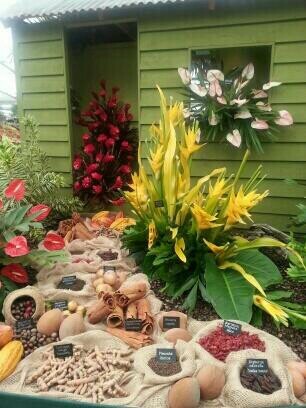 The focus of the stand is displays of whole spices plus the exotic, spicy colours of Grenadian flora. Gaywood’s design highlights the rich vegetation typical of Grenada’s rainforest plants on one side, and a beach scene on the other. The display enthralled Press Day visitors including Grenada’s Minister for Tourism and Civil Aviation, Hon Alexandra Otway-Noel, and Dr Johnson Beharry VC. Beharry, who was born in Grenada, is the recipient of the highest military decoration for valour in the British and Commonwealth armed forces. Other celebrity visitors included Piers Morgan, Fiona Bruce, Lesley Garrett and Sandie Shaw. The 2014 sponsors of the Grenada pavilion were the Grenada Tourism Authority, Peter and Lana de Savary for Mount Cinnamon & Port Louis, Calabash Hotel, Coyaba Beach Resort, Lanwades Stud, Seafreight Line, John and Joan Buckenham, Hyde Park Tropical Garden, Reg and Trish Scarlett, Blue Horizons Garden Resort and British Airways.